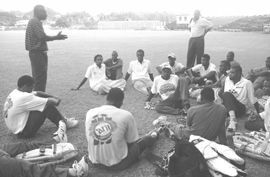 The 24-man training squad for the Stanford 20/twenty tournament set for July/August in Antigua and Barbuda began in full its eighteen -week preparation regimen earlier this week at the Arnos Vale Playing Field. And, a cadre of personnel has already been identified to carry the players through their paces. Among them are senior national coach Ian Allen, Clarence Thomas, Irvin Warrican, and Woodrow Williams. Provisions have also been made to have specific technical persons incorporated from time to time. The last four weeks of training will focus on sharpening the skills of the fourteen players who make the final cut. The squad selected only from teams in the RBTT Premier Division, shows the recall of veteran opening batsman Dawnley Joseph. The pugnacious former West Indies A team player, and former Windward Islands captain, has been consistent at the domestic level over the years, and was the leading scorer in last yearâs Premier Division competition. Joseph turns 40 in August. Also selected are Josephâs Spartans teammates brothers Nixon and Kissinger Mc Lean. Those selected mainly for their batting ability are Danson Andrews, Miles Bascombe, Nicholas Baptiste, Rommel Currency, Drumo Toney,Donwell Hector, Kenroy Martin,Oâneil Thomas and Roland Wilkinson. Salvan Browne and Lyndon James who is playing club cricket in Trinidad and Tobago are the chosen wicket keepers . The spin department sees Dyke Cato, Orlanzo Jackson and Mahlon John earning places. The heavily packed fast bowling section has Othneil Baptiste, Deighton Butler, Hank Hall, Dellorn Johnson, Kenroy Peters, Nigel Straugh and Norlan Williams, added to the two Mc Leans. Butler and Nixon Mc Lean, the two players in the squad with international experience along with Joseph will be called upon to give additional guidance and complement the coaching staffâs efforts. The lucrative package deal involved US$100 000, as start up monies for the development of a facility, which the local cricket association has already received. In addition, each participating country gets US $10 000 per month as stipend for players and coaches. Also forming part of the package is US$ 5000 each month reserved for preparation of training ground(s).In total each team is offered a guaranteed US$280 000. Airfare, accommodation, uniforms, equipment and other perks are part of the deal to be borne by the orgainsers. The winning team is certain of US$ 1 Million .The second place team gets US$500,000, with the cricket boards of the two top finishers in line for US$ 200 000, and US$ 100 000 respectively. Following the 20/twenty tournament, a âwinner-take-it-allâ of US$5 Million is planned for November between a Caribbean Superstars XI and a world class team. The entire Stanford sponsorship is worth US$28 Million.